In this volume leading feminist theorists re-think the traditional concepts of political theory and expand the range of problems and concerns regarded as central to the analysis of political life. Written by well-known scholars in philosophy, political science, sociology and law, the book provides a rich interdisciplinary account of key issues in political thought. While some chapters discuss traditional concepts such as rights, power, freedom and citizenship, others argue that less frequently discussed topics in political theory - such as the family, childhood, dependency, compassion and suffering - are just as significant for an understanding of political life. The opening chapter by Narayan and Shanley shows how this diverse set of topics can be linked together and how feminist theory can be elaborated systematically if it takes notions of independence and dependency, public and private, and power and empowerment as central to its agenda. This book will be of interest to a wide audience concerned with the study of gender, and to all those in political science, philosophy, legal studies and women's studies who are interested in the way in which political theory and practice can be fruitfully reconceived with the help of feminist perspectives. Mary Lyndon Shanley is a feminist legal scholar specializing in issues of the American family and reproductive technologies. Her book Just Marriage weighed into the controversy around gay marriage with a historical and political science perspective. Uma Narayan is an Indian feminist scholar, and a Professor of Philosophy at Vassar College. Introduction by Narayan and Shanley. 1. Alchemy or Fool's Gold? Assessing Feminist Doubts about Rights: E. Kiss. 2. Decoding 'Dependency': Inscriptions of Power in a Keyword of the US Welfare State: N. Fraser and L. Gordon. 3. Towards a Feminist Vision of Citizenship: Rethinking the Implications of Dignity, Political Participation, and Nationality: U. Narayan. 4. The Jurispolitics of Privacy: A. L. Allen. 5. Revisioning the Family: Relational Rights and Responsibilities: M. Minow and M. L. Shanley. 6. Political Children: Reflections on Hannah Arendt's Distinction between Public and Private Life: J. Bethke Elshtain. 7. The Heady Political Life of Compassion: E. V. Spelman. 8. Feminism and Power: A. Yeatman. 9. Rethinking Anarchism/Rethinking Power: A Contemporary Feminist Perspective: M. Ackelsberg. 10. Intersectionality and Identity Politics: Learning from Violence against Women of Color: K. Crenshaw. 11. The Theory and Practice of Freedom: The Case of Battered Women: N. Hirschmann. 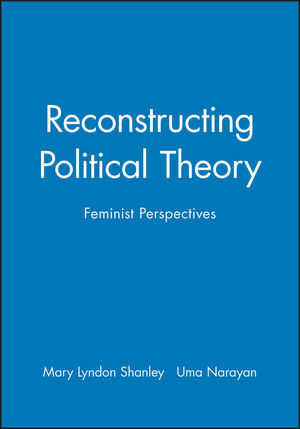 * This volume rethinks - from a range of feminist perspectives - the major concepts of political theory and expands the concerns traditionally regarded as central to political life. * Includes chapters written by leading scholars in philosophy, politics, sociology and law which together provide a rich interdisciplinary analysis of critical issues in political theory. * Covers conventional concepts such as rights, power, freedom and citizenship, as well as less-frequently discussed topics such as dependency, childhood, compassion and suffering.